There are two maps at the link above. Page 3 of the pdf file is the updated version. Rd 4614 and 4615 are labeled backwards. 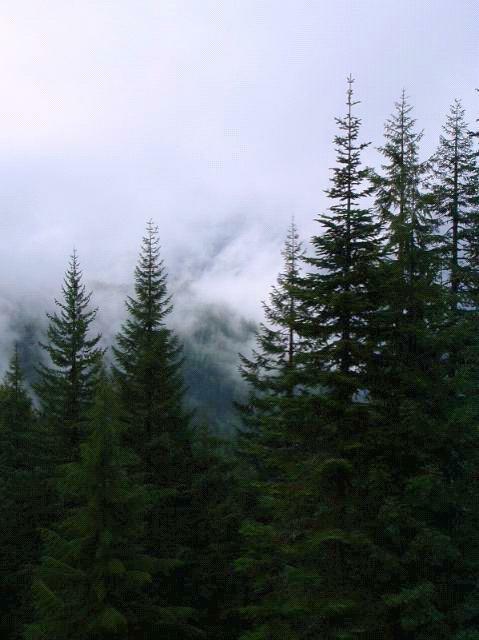 Also, the view from Old Baldy referred to in the USFS Info sheet has been reduced by advancing timber. The trails in this area mostly pre-date the Forest Service. Consequently, they are “evolved” trails never formally built to Forest Service standards. The routes are uncompromising in logic and purpose, except for a few relocations. They can be quite steep. The Old Baldy and Old Bissell Trail are part of an ancient cross mountain route. Most of the timber is a little over 100 years old. The area was a prolific berry producing area before the rampant burning of the area was halted by the establishment of forest protection at the beginning of the Twentieth Century. 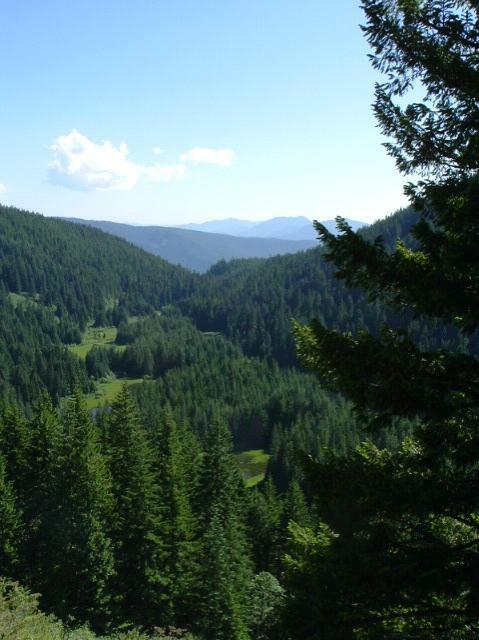 The consequence of the even-age timber stands are a lack of varied ecosystems. Nonetheless, the impressive stands of Noble Fir are awesome and there is a general quietude in these dark stands that is pleasant to experience. Trail 502-A accesses the 502 trail from a lower elevation. See the map (page 3) at the link above. This route provides access earlier in the season as lingering snow on the roads in sheltered areas limits access to higher trailheads. The trail departs from the 4615 road about 2.7 miles from the junction with 4614, the main road serving the area from Estacada (Squaw Mtn Road). Look for an entrance into a young stand of trees just after the first side road on the right. There is a parking area immediately beyond. The trail is an old route that rises directly through a 16 year old and 8 year old cut over area leveling off in big timber above. The clearcut area allows abundant views, a proliferation of wildflowers (huge white iris display), active bird life, and sun. The trail crosses the 4614 road and a creek at this location and continues up the hill to the intersection with the 502 trail. There have been some trail revisions altering the route of the 502 trail to avoid the clearcut visible at one point on the left as you ascend the 502-A after crossing the 4614 road. Unfortunately, they also hide the only year round spring in the area which had been on the old route. It is in the clearcut in a draw below the landing at the top of the road into the harvested area. You can get to the landing by heading straight for the opening in the woods when the trail makes a hard right turn about a quarter mile or less from the 4614 road. The upper section of the trail is easy to follow and in relatively good shape (for an abandoned trail). 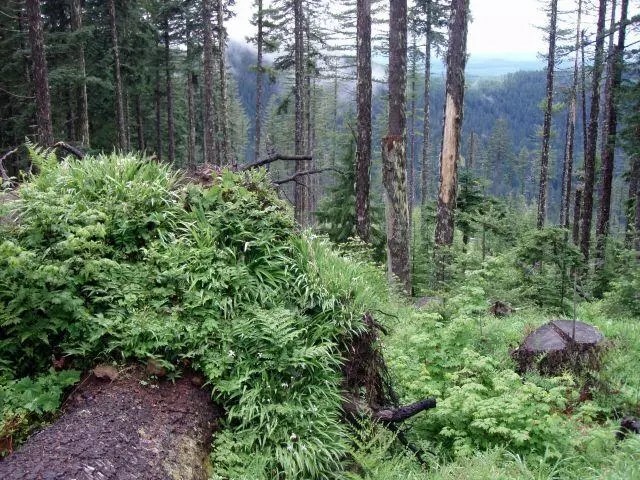 The lower section of this trail past the lower clearcut is much more difficult to follow, is more faint, and requires good navigational skills. The later in the season it is, the harder the trail is to follow since the ground cover starts to hide the trail track. There is a large tree that has blown down in the clearcut, and this is the point where the trail takes a hard right (west). The trail picks up downhill from the tree’s rootball and heads pretty much straight downhill from there. Gains 1100ft in 1.11 miles between these two roads. The Bissell trail has been abandoned for some time. The route is faint and easy miss in places. Has been cleared recently from the 502 trail a half mile short of the Old Baldy summit to the 4615 Rd. There is access to the 4614 Rd by way of a short side trail. Some of the flagging along the route is for other purposes so make sure you are seeing old blazes (of which there are plenty) along the way. Just before the 4615 Rd the route leaves the old route and makes a short detour to a parking area and the road at the end of the pavement. Use of this trail creates several two car shuttle hiking options but should only be used by those savvy in the woods. Gains 800ft in the first .8 mile, then levels. 1.31 miles to the Trail 502 junction. There is an access trail at the saddle between Squaw Mountain and Twin Springs. This side trail is hard to find from the bottom so make a landmark if you explore the meadows and want to climb back out. Also, some of the meadows are essentially floating peat so don’t fall in to the waterways cut below as one hunter we met did, much to his surprise. This is the most ecologically interesting area for miles in all directions.